An American Fork family reportedly adopted a 4-year-old Russian girl with Down syndrome just days before Russian President Vladimir Putin signed a bill banning Americans from adopting Russian children -- presumably making the girl, Hazel, one of the last of those now-banned adoptions. Heather and Jeremy Fillmore welcomed Hazel into their American Fork home only an hour before Christmas began, the Deseret News reports. It took about 11 months for the Fillmores to bring the girl home from Russia prior to her arrival at Salt Lake City International Airport. The Fillmores will be among the last of more than 60,000 American families to bring up a Russian child as their own as Russia signed a bill this week outlawing the process. President Vladimir Putin's approval of the adoption ban will leave nearly 50 Russian children on the verge of adoption by U.S. families now stranded. 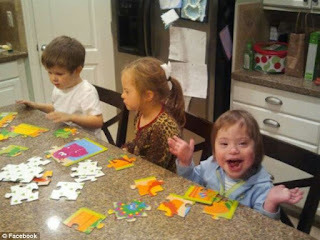 The Fillmores found Hazel through a website that advocates for children with special needs called Reece’s Rainbow Down Syndrome Adoption Ministry. She was the family’s second girl they adopted from Russia via the website. Anya, now 7, was adopted in March 2011, the newspaper reports. Putin on Friday signed a bill banning Americans from adopting Russian children, part of a harsh response to a U.S. law targeting Russians deemed to be human rights violators, the Associated Press reported. Children's rights ombudsman Pavel Astakhov said 52 children who were in the pipeline for U.S. adoption would remain in Russia.